Bowl of porcelain (one of a pair with 38.494). Made in China, late Ming Dynasty. Frank Partridge & Sons, dealer; from whom purchased by Sir William Burrell, 29 October 1946, �45 (pair, 38_494-495); by whom gifted to the Corporation of the City of Glasgow, 1946. 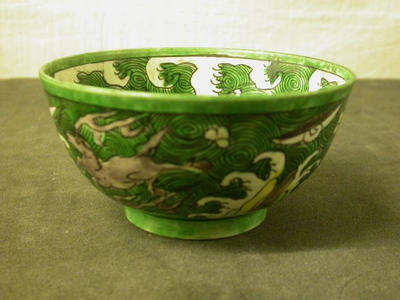 Sir William Burrell, Purchase Book 1946, p.84: �Pair small Chinese bowls of bright green ground decorated with whorls and galloping horses in aubergine and single white flower heads. Ming. 5" diam�. Sold by Frank Partridge & Sons 1946.